The Man Bird and I do like food; perhaps as well, given that it forms the basis of the blog! 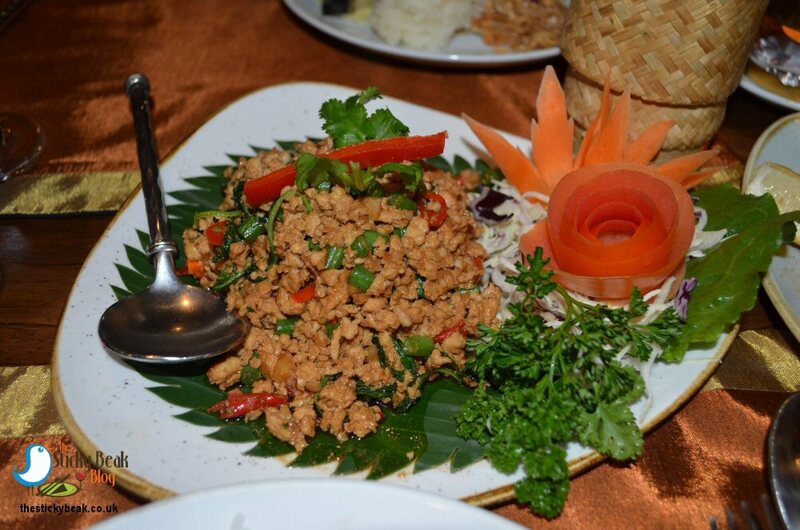 On occasion we like to have spicy foods, and Thai cuisine has some amazing spices and herbs within its genre that particularly appeal to us. 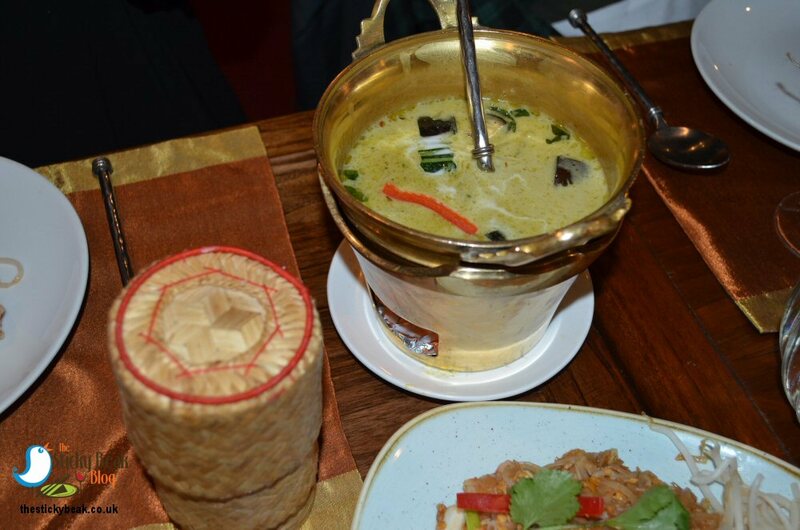 Simply Thai in Buxton offers a range of stunning dishes, some of which we sampled on a previous visit there with Mummy Bird and Chickadee. 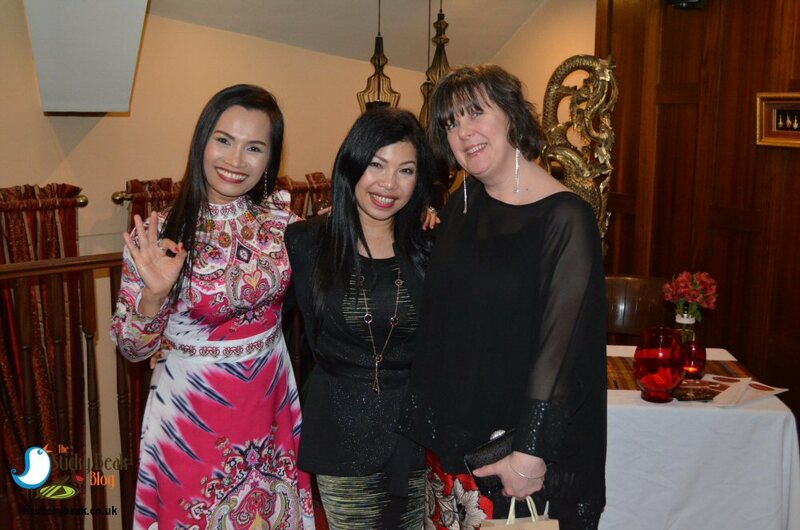 The owner of this superb venue is the gorgeous, bubbly Mim and she kindly invited us along to a soiree that she was hosting for a select few guests and family members. Mim had organised an evening where several of her favourite dishes were going to be served, along with Moet et Chandon Champagne and Chateauneuf Du Pape wine; this lady doesn’t do things by half, that is for sure! It had been quite a while since we’d last seen Mim, but when we stepped inside His Nibs and I were given the warmest hugs and kisses and it was as if we’d only seen her the week before. The great thing about Simply Thai though is that this level of welcome is extended to every guest that walks through the door (minus the hugs and kisses part, at first!). 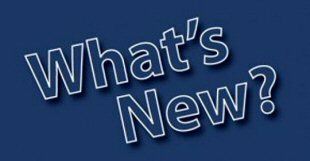 The downstairs area of the restaurant was very lively for midweek and looking at the smiles on peoples’ faces and the laughter coming from various parts of the room, I think it safe to assume that the standard of food and service was up to its usual high standard. We were escorted to the upstairs area of Simply Thai where our coats were taken from us, and glasses of chilled Champagne in beautifully decorated glasses were placed in our hands. Other guests began arriving and soon the room was filled with chatter and introductions were being made. Each guest had a name card on the table so we took our seats and began nibbling on the spiced crackers and sweet Chilli dip in front of us. I’d forgotten how good Simply Thai’s crackers are, they are thicker and crispier than standard Chinese varieties and they have a fab zing to them on the tongue. It didn’t take us all long to see them off! 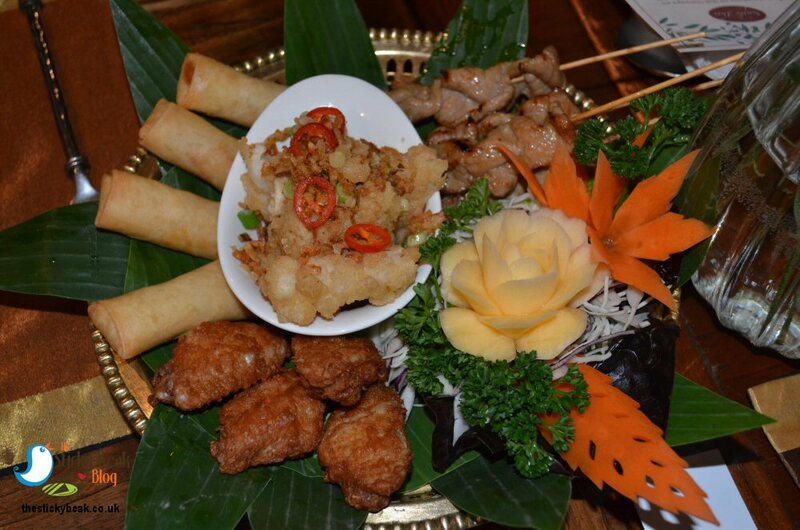 The first course Mim had her team serve to us was a variation of the Simply Thai mixed platter; there was the Spring Rolls and Thai salad from the regular menu, accompanied by Thai style Chicken Wings, The Calamari Tempura and Moo Ping (grilled marinated Pork skewers). Large platters of these morsels were placed between every four people, and the carved vegetables on the salvers looked breath-taking. 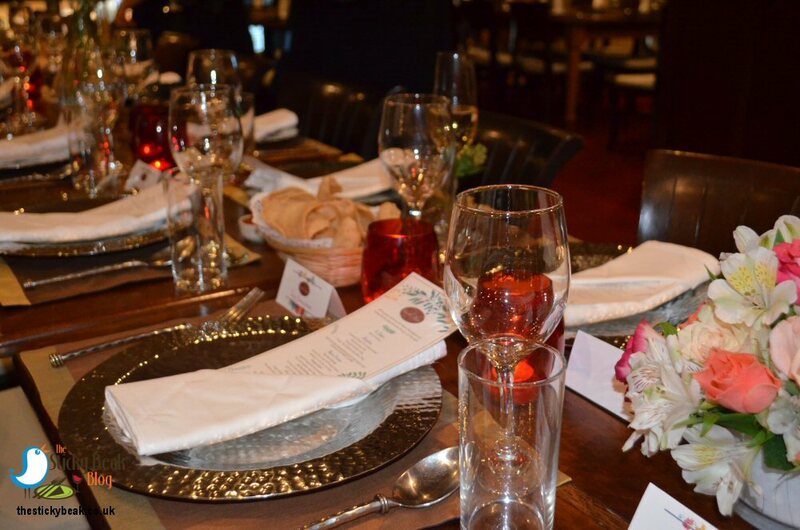 We all dived in, oohing and aahing with delight as the tastes and textures hit our palates. My taste buds were doing a tango of joy as the heat from the spicy Thai Sriracha sauce that I’d dipped my Calamari into hit them. When Calamari is cooked properly it is beautifully soft when bitten into, and Head Chef Sangkhom does it perfectly. The combination of the seafood and feather-light Tempura batter was incredible – very moreish. The Moo Ping was the perfect showcase of tastes, textures and flavours; Coriander root, Oyster sauce, Soy sauce and Palm sugar all combined to create the most fragrant marinade for the tender Pork pieces. Tamarind sauce imparted its unique spicy, sour taste to the dish via a dipping sauce and this tempered the sugar notes wonderfully well. The size of the spicy Thai style Chicken Wings wasn’t to be sniffed at – they were nice and generous, and the coating on them was giving a nice tingle on the lips. 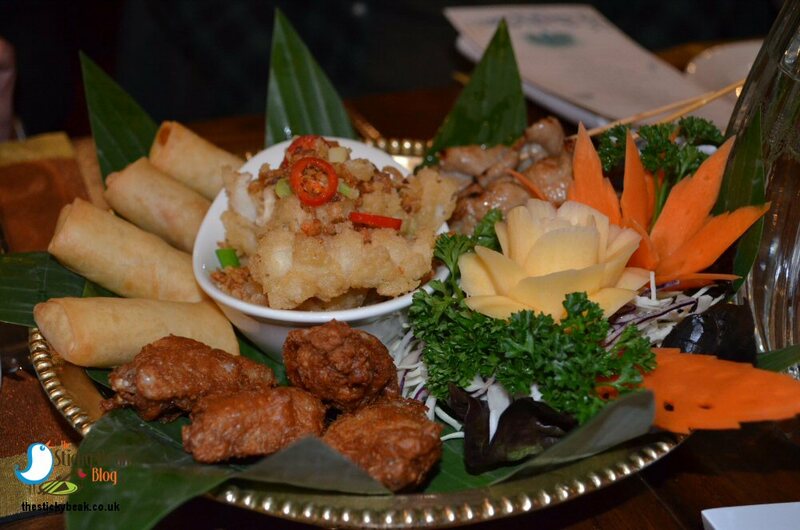 His Nibs does love a Spring Roll and the ones Mim serves at Simply Thai in Buxton are just the best with their ultra-crispy outers and more than ample, flavoursome filling. Everyone’s initial hunger pangs had been quelled and happy smiles could be seen the length and breadth of the table. Mim’s wonderful team of staff were seamlessly filling glasses with Champagne or red wine, as well as providing iced water to those guests who wanted it. 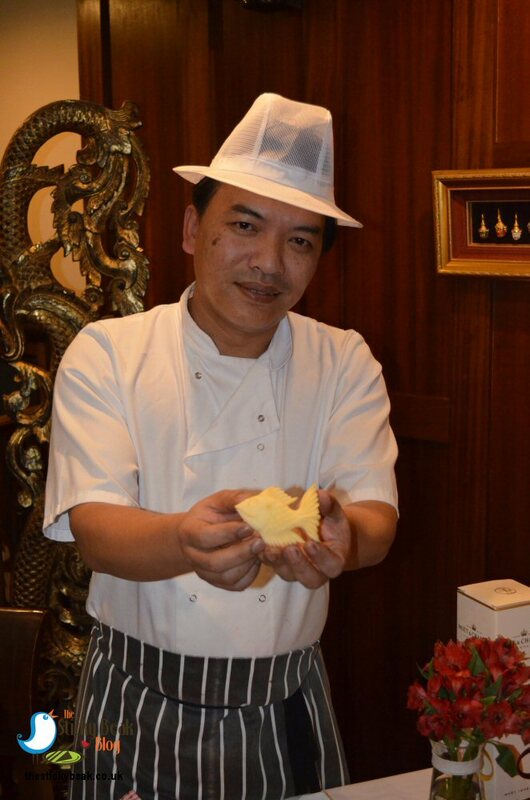 Clearly there was going to be a lull in proceedings as the kitchen team set about cooking the selection of main course dishes, so Head Chef Sangkhom took centre stage and began a fruit carving demonstration for us. Honestly, I was completely mesmerised by this gentleman’s skill and dexterity as he wound his way hither and thither through the flesh of fruits and vegetables, transforming them into objets d’art. Tomatoes became Roses, Carrots were teased into fluted flowers, and Swede was transformed into Water lilies and Koi fish. The room came alive with conversation about the skill and patience it must take to learn this art of fruit carving, and it is an art make no mistake! 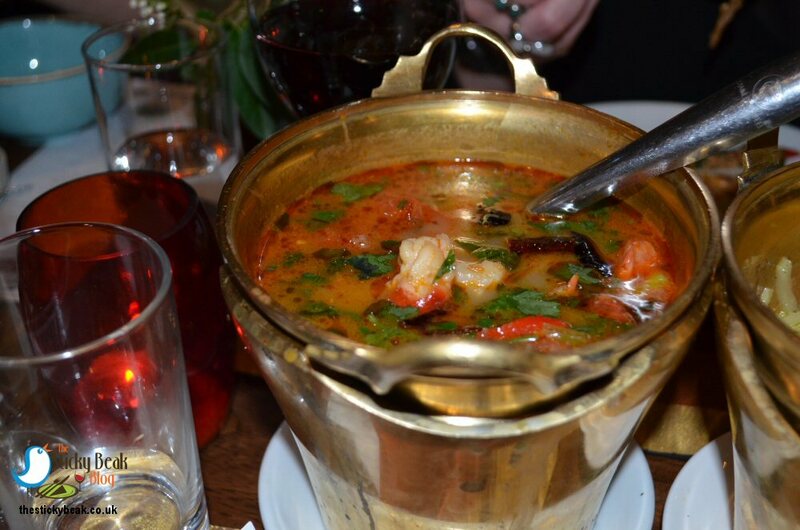 Before long, a whole raft of platters was placed on the table (again between quartets of guests) along with tureens of Simply Thai’s infamous King Prawn containing hot-and-sour soup, Tom Yum Goong. Not much makes me catch my breath and my eyes water, but this liquid minx certainly did!! The flavours are very clean and fresh on the palate though, and the great sourness of Galangal and Lemon juice really cuts through nicely. Dragon strength spiciness it may have, but it’s so delicious and strangely addictive; I had seconds and thirds in my little soup bowl. You can’t love Thai food and not appreciate a classic Green Curry; its medium heat gives it wide appeal and the Chicken version Mim served us was exquisite. Moist, tender Chicken pieces were combined with a coconut milk-based, Sweet Basil augmented sauce with crunchy Bamboo shoots, Aubergine quarters, and Courgette slices. I opted to have the Sticky rice with my curry as I enjoy the comfort factor of its glutinous texture; The Man kept things a little simpler with his choice of steamed rice. 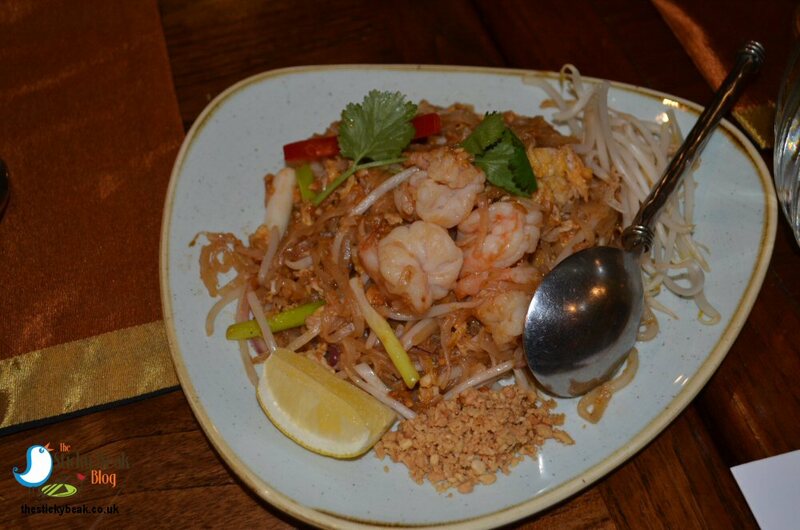 For those needing a breather from all the spice, Pad Thai Goong was the go-to option. The stir-fried noodle based dish is enhanced with King Prawns, Egg, Tofu slices, Radish, Bean Sprouts, peanut, and Spring Onion. A garnish of fresh Bean Sprouts adds extra crunch and texture as well as being gorgeously light in the mouth. 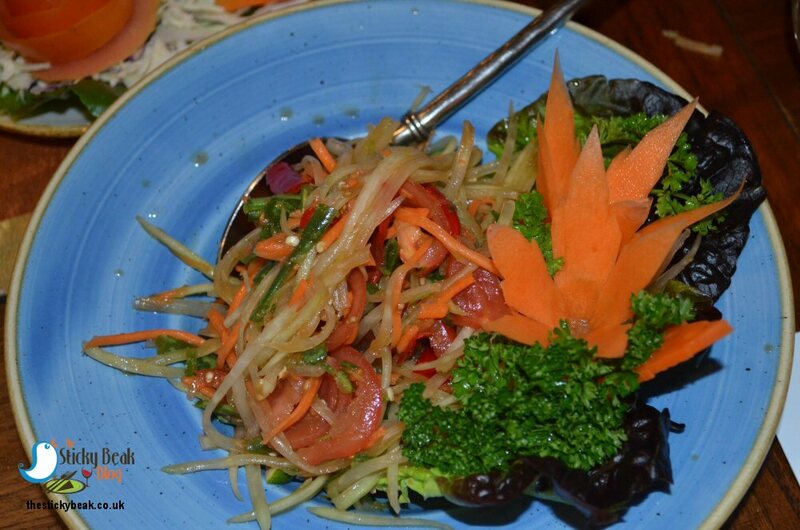 Vegetables are far from plain, boring, or uninspiring at Simply Thai. 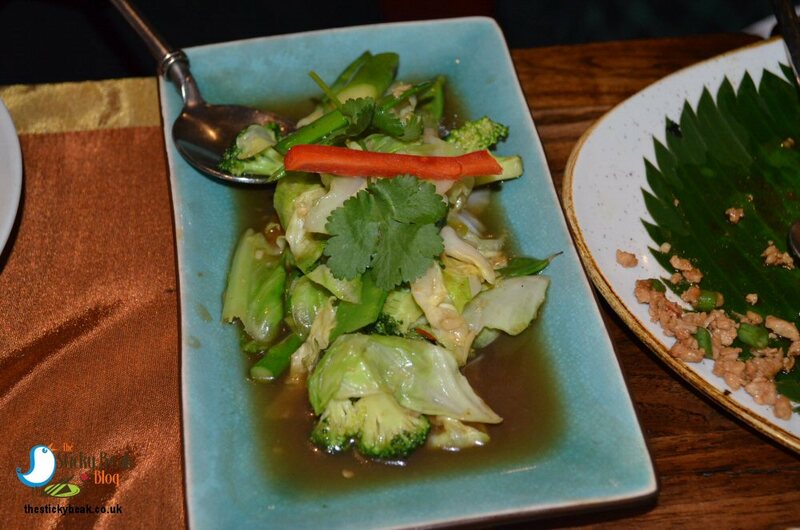 Large platters of garnished, stir fried seasonal Green vegetables with fermented Soy beans, Chilli and Garlic kept the taste buds on high alert, and their crunch and fresh flavours were heartily welcomed by the room. The Spice-o-meter was ramped up again with the colourful Gai Pad Kra-Pao – that’s stir fried Chicken with Basil leaves, Chilli, Garlic, Peppers, Onions, Fine Beans, and Bamboo shoots to you and I! The addition or omission of key Thai spices alters the character of each dish and, despite the tongue tingle, you can easily discern differences between dishes. 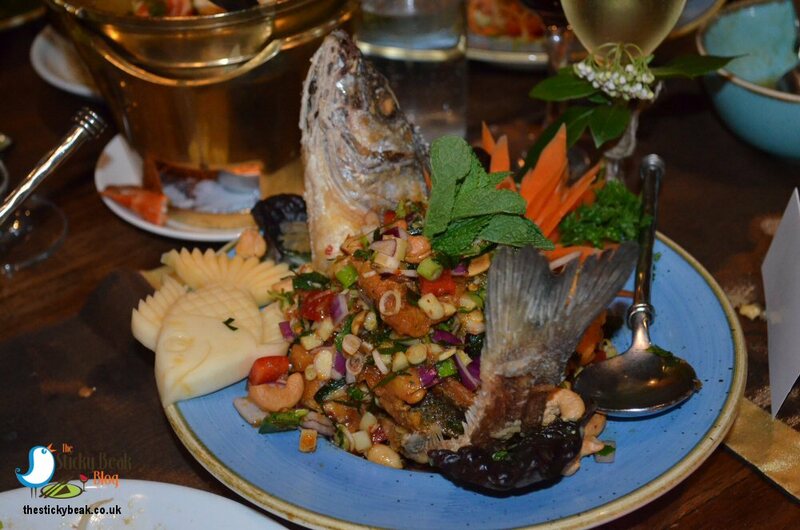 For me, the piece de resistance was the visually stunning Pla Lui Saun Samun Prai; crispy whole Sea Bass - head still on, though not smiling at you! The heat comes from the simple, spicy Thai herb salad sauce and Ginger, neither of which overwhelmed the delicate Sea Bass taste. Crunch is provided by whole Cashew nuts, and I have to say this was my second favourite dish of the evening. Thai salads are never lacklustre affairs, and in fact all the ones served at Simply Thai in Buxton are rated as very spicy. One of Mims favourite dishes is a Papaya salad from North Eastern Thailand and she described it to us as very spicy, so I gave it a healthy respect as I tried my first mouthful! This salad has strips of Papaya in it amongst other things and it does look beautiful with all its colours. Mim then informed us that there is fermented fish (or Stinky Fish as she calls it!) in the salad too, which made for a few quizzical looks. A few eyebrows were raised too at the mention of fermented fish, but with loins girded by the free flowing Champagne and Chateauneuf Du Pape, His Nibs and I dived in followed by our fellow diners. I honestly don’t know what I was expecting, but it certainly wasn’t the deliciousness I got; the fish factor wasn’t high at all and it certainly didn’t taste odd. I really enjoyed this, and for me it was probably my new favourite food and the top-rated dish of the night for me. There’s no denying the spiciness, but it was a clean fresh heat and the fresh Papaya assuaged its intensity I thought. Mim had really gone to a lot of effort to represent the finest of her home country’s cuisine, and in my opinion she really did it justice. 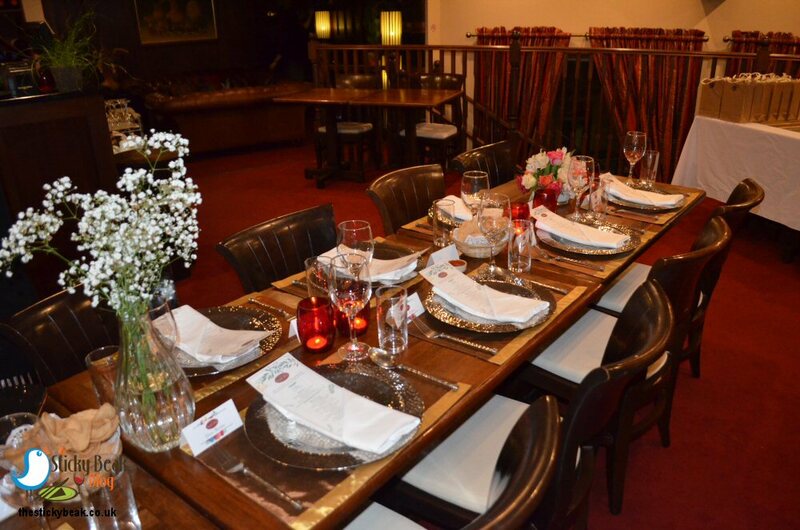 Everyone remarked what an incredible feast it had been, and thanked Mim and her team for their efforts. 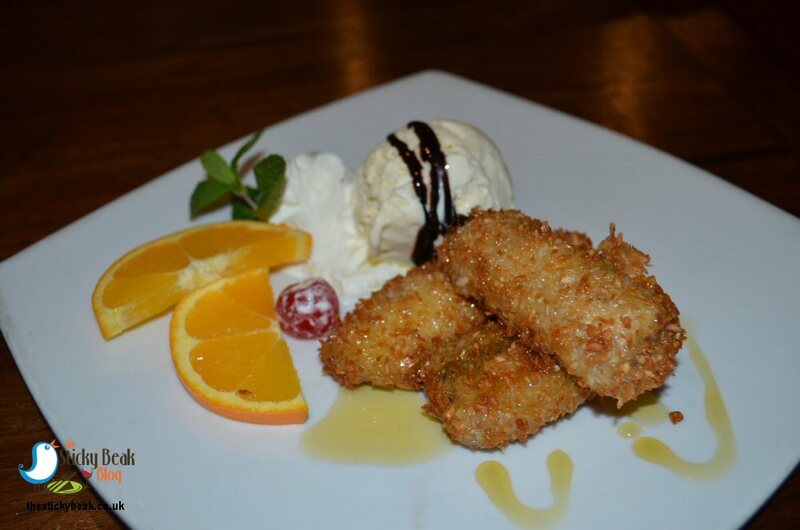 All that remained was to choose a dessert from Simply Thai’s menu and enjoy tea or Peang Thai coffee (roasted down the road at the Buxton Roastery). 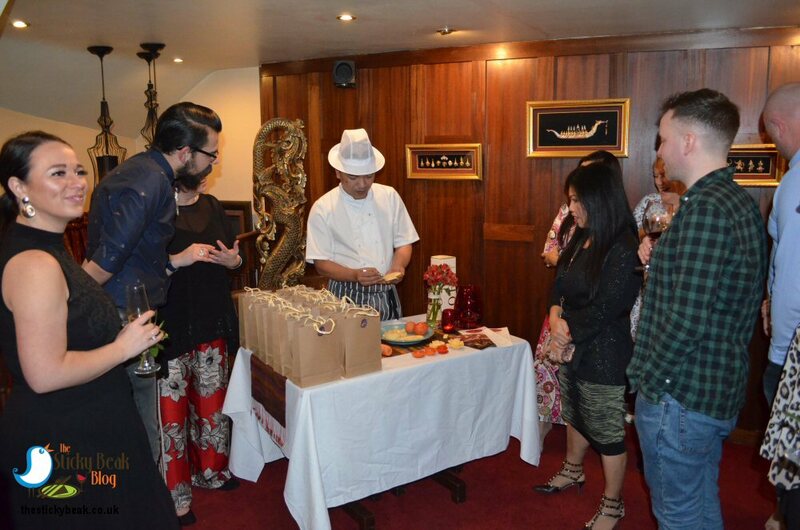 Each guest received a goody bag containing a bag of the Peang Thai coffee that was ground ready for use in a Cafetiere. The shade grown coffee beans have a gorgeous rounded character that lingers nicely in the mouth, and The Man Bird and I are fans of it already! The evening with Mim had been astounding, and if you want to experience a bit of this magic for yourself all you have to do is get in contact with the team and book a table. Simple! Hot, Spicy wings awarded to the beautiful Mim and her excellent team.